Without getting lash extensions, I have been trying to get longer lashes. Recently, I got a sample of a lash primer - and decided to give it a try along with few others, and I can honestly say these three products have made a big difference. 1. I start with a lash primer. When I received this sample in the mail, I was skeptical; however, it really does work. This option is more affordable. 3. I use this product to add volume. I usually alternate between steps #2 and 3 until I have the desired look. This cozy 2-in-1 fleece tunic is on sale for only $36 - and comes in several colors. This open toe booties would be perfect for spring and is only $80. This sweater is on sale for $6! This sleeveless ruffle shirt is only $18. This comfy sweater in a bright spring color. A cute blush and palm print dress for summer. I like this sleeveless striped sweater dress. I love this linen shirtdress! This journal/planner is great at keeping track of your goals. These wedge espadrille slides look comfy. This is such a pretty white lace dress for only $38. I want to get these pants - I love the color. I got this necklace - and I can't wait to wear it with this blazer. This pink blazer with gold buttons is on sale for $30. Today starts the big - up to 25% off designer and items that do not typically go on sale. 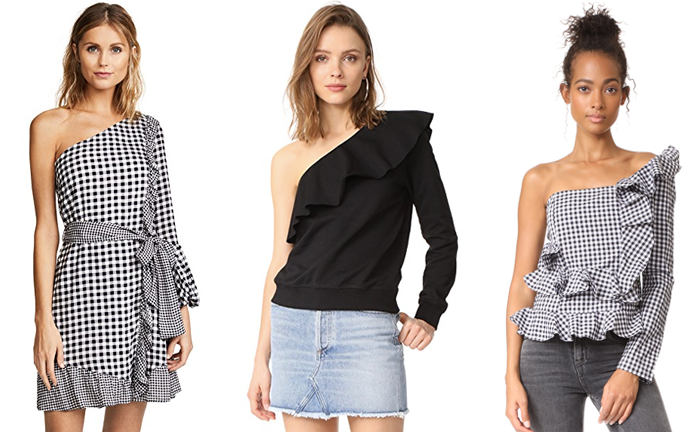 The one shoulder trend and gingham are two big trends this season - and here are a few picks. Use the Code "Event18" for the savings. All three of these are an additional 20-25% off - and free shipping! If you have not already, you can sign up for my emails, which will send you an email of my posts. Just enter your email on the right of the screen under "Follow". I am so cold and was just laughing because I have to style another sweater. This look is so perfect and great for today! Thanks for the inspo during these weird weather times! I love the necklace you got from the Loft! And that blush/palm dress!! Have a GREAT day! I love the L'Oreal lash primer. I don't use it everyday because I am lazy but it really does make a difference and the price is right! You had me at pink sweater. But for only $10?! I've always wanted to try lash primer, but keep forgetting to buy some...although I'm not sure if anything will/can help my poor short lashes! Pinned the gingham dress (adorable) and the el cheap-o primer! Just ordered Grande Lash yesterday, which truly works, too. But $$ hard on my budget since I am no longer working much. Love the pink outfit with the leopard. How are you coming on the launch of your own items??? Love hearing your lash routine. I started using a serum, and I think it has really helped. Love the leopard booties and all the cute gingham options!